Seventy-one years ago, on October 14, 1947, U.S. Army Air Force Capt. Chuck Yeager piloted the Bell X-1 rocket plane on history’s first successful flight past Mach 1. He broke the so-called sound barrier, but a lot of other walls were demolished to get him there. Toward the end of World War II, prop-driven fighters were maxing out at speeds over 400 mph. Jets left them behind, and it was clear that the speed of sound (750 mph at sea level) was within reach. There was a problem though: the aerodynamicists’ essential data-collecting tool, the wind tunnel, wasn’t up to speed. There weren’t any that could push air past the speed sound in any practical way. While most engineers scoffed at the idea of a so-called sound barrier, it was clear that supersonic flight had unknown challenges and designing for them was daunting. By 1944 leaders at America’s premier aeronautical research agency, the National Advisory Committee for Aeronautics (NACA, NASA’s predecessor) thought supersonic wind tunnels will have to wait. It was time to leap ahead and develop planes used expressly to research the new realm of Mach 1. The Navy and the Army, looking to secure post-WWII dominance in the air, agreed. By charter, the NACA could not build planes. Since its founding in 1917 it was involved in aeronautical research using off-the-shelf aircraft, wind tunnels and other means to advance the art and science of aviation. The military also had their research arms, including the Navy Bureau of Aeronautics and Air Force Material Command, and they wanted a greater hand in new aircraft development. In 1944 they all combined forces for the first time and looked to several American firms to design, build and test a supersonic research airplane. It was a unique alliance, and it had a rocky start. Bell Aircraft in New York state was awarded a contract with the Air Force and the NACA for the fighter-sized, rocket-powered MX-653. The Navy stayed onboard but splintered into another direction with some jet-powered Douglas Aircraft designs. Rocket engines were chosen for the MX-653 because they produced more thrust than jets. The drawback was they exhausted its fuel supply in about 10 minutes. It soon became apparent that the original concept of the plane taking off from the ground and climbing to its optimum flight level at 30,000 feet would not leave enough juice to go supersonic. All anyone wanted was a good two minutes of level flight to reach Mach 1 (diving for speed was like cheating). So that plan was scrapped in favor of Bell’s suggestion of using a modified B-29 to carry the plane in its belly to about 20,000 feet, where it would be released and be on its merry way into the unknown. The flight would end with a glide back to the runway. The MX-653 was designed with considerable input from the NACA, not always welcomed by Bell. There were disputes about supervision, whose pilots—Bell’s or the NACA’s—would fly the plane, and where the plane should be tested (the NACA wanted to fly at its home base in Langley, Virginia). As the plane neared completion in November 1945, the Air Force, with paternal firmness, laid down the law to keep things moving. It also designated the plane the XS-1 (for Experimental Supersonic-1). And by the way, another XS-1 was also to be made (using thicker wings), and once they were flying, another. 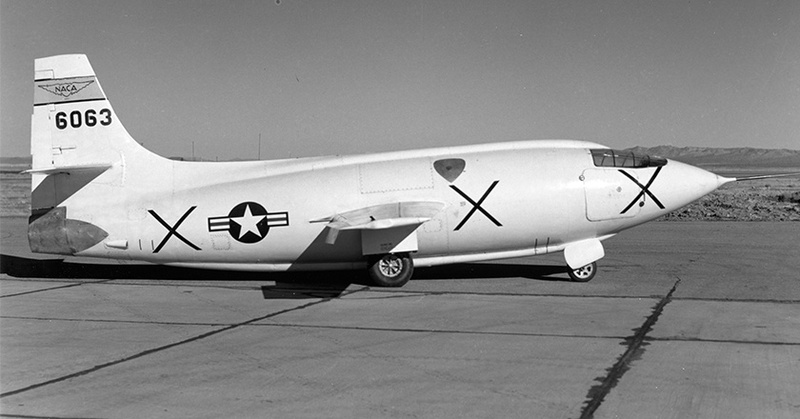 In December 1945 the XS-1 #1 was ready to fly. The NACA lost its turf battle because of Virginia’s nasty winter weather. To keep the program going, gliding test flights began in January at the Pinecastle Air Base, Florida, with a Bell pilot at the controls. In the meantime, plans were underway to shift everything to the Air Force’s isolated outpost in the desert north of LA, Muroc Air Base. The NACA group wasn’t pleased. They would have to completely relocate and set up shop. Oh well. By June 1946 the Air Force wanted to get this sound barrier business settled and move on to higher and faster flights. It set a plan—Air Force would put XS-1 #1 in the fast lane to Mach 1 using one of their pilots, while the NACA can use XS-1 #2 to continue research flights at their own, glacial pace using NACA pilots. After 12 more test flights with Bell pilot Slick Goodlin, XS-1 #1 is turned over to 24-year-old Capt. Yeager on Aug. 6, 1947. He busts Mach 1 on his 13th flight (including one flight in XS-1 #2). The XS-1 program unintentionally accomplished much more than its supersonic goal. It brought together the best in the aviation science community, the military and industry for the first time to pursue a common mission into an unknown realm of flight. The warring egos and turf wars were ultimately resolved when the players were forced to work together and form a new community at Muroc Air Base. Only then did Muroc flourish as a sanctuary for brilliant engineers and misfit flyers with the right stuff. Renamed Edwards Air Force Base, it’s been the unruly place that has influenced just about every aspect of flying (on Earth and other worlds) ever since. Want to explore some of our historic aircraft? Check out the online catalog! *This article was originally published in the September/October 2017 issue of Aloft and has been updated for digital distribution. In-text image photo credit and caption: U.S. Air Force. XS-1s Number 1 and 2 in the loading pit. Each plane was lowered into a pit so the B-29 mothership in the background could be rolled into position above it, then the XS-1 would be raised and fastened to the B-29’s bomb bay for flight. 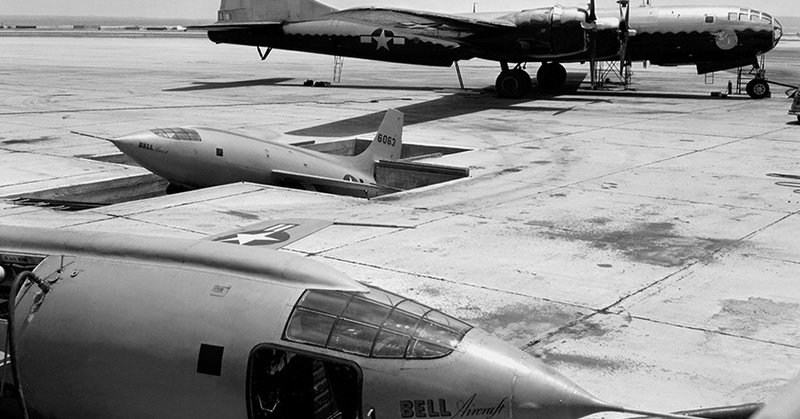 Later renamed them X-1s.